Improved enjoyment of travelling with mobile homes due to better safety, comfort, agility and convenience. High safety reserves, prevention of under-inflation, longer service intervals. Reduced braking distance in the wet. High load capacity particularly for camper van applications, improved endurance in rough camping conditions. Safer driving stability for rear-heavy camper vans. Extra driving stability for rear-heavy camper vans. Improved durability in rough camping environments. Engineered in Germany, Continental develops award-winning premium tyres with optimum braking performance and safety. The VancoCamper is the ideal partner for your motorhome. It meets the demands of camping vehicle manufacturers, as well as campers and caravaners themselves. It complies to the special „CP“ (Camping Pneu) tyre standard. Its base van construction gives you excellent mileage potential, whilst the use of extra reinforcement enables up to 5 bar of pressure ensuring optimum vehicle stability even under heavy rear payloads. Whether on or off-road, the VancoCamper gives you peace of mind with a smooth safe drive. 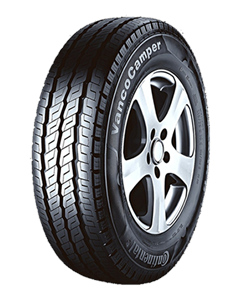 Sorry, we currently do not have any tyres with the Vanco Camper pattern in stock. Helpful practical staff. Excellent prices, nothing is too much trouble. Highly recommend. I started going to Alnwick Tyres a couple of years ago because I had previously felt that I was being given poor advice and was being ripped off in terms of price. I have now used Alnwick Tyres on a number of occasions and I have no hesitation whatsoever in recommending them. I have been totally satisfied with the service I have received and the prices I have been charged. This is not a flashy bells and whistles company it is a proper old-fashioned honest and decent setup which is exactly what I want. You won't be told you need new tyres if you don't and you won't be sold top of the range ultra expensive tyres if you simply don't need them. I trust these people, they are fair, decent and thoroughly pleasant to deal with.